Solid steel frame with enclosed ribbed plastic shatterproof handle for good grip and comfort. The.. 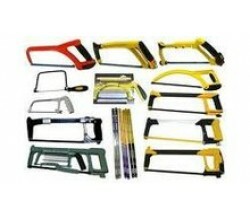 The Bahco 319 Professional Hacksaw Frame has a lightweight 2-component frame with steel core and is .. The Stanley FatMax folding jabsaw has a three blade locking angle mechanism at 90.. This FatMax multi saw has a durable tension nut which allows quick and easy blade changing. The saw .. Flexible Bi Metal High Speed Steel Hacksaw Blades Hard Metals 3 to 13mm Thick Soft Metals 3 to 6m.. The Stanley Sharpcut is a heavy-duty saw with hardened teeth ground on three edges for faster, easie..
Ultra power saw blades are super HSS with molybdenum and are vacuum heat treated for exceptional too.. Flexible High Speed Steel Hacksaw Blades..